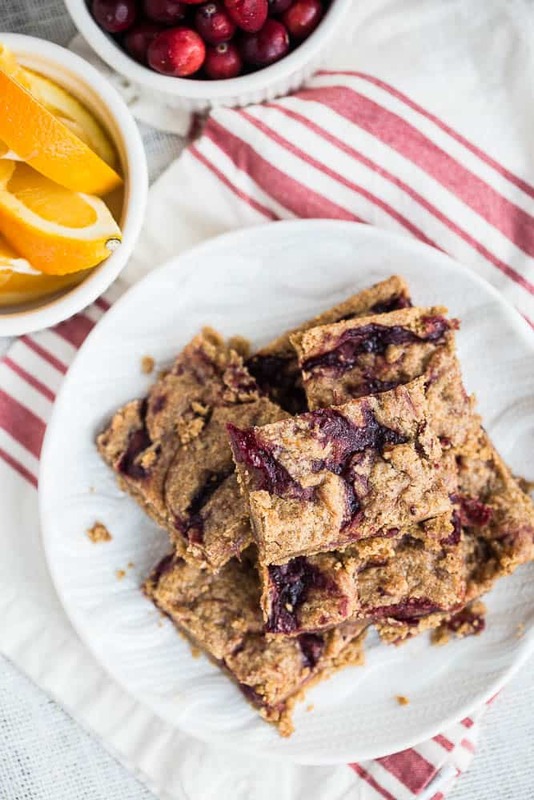 I REALLY hope you saved some leftover cranberry sauce for these orange cranberry bars. I used my Wassailed Cranberry Sauce, but you can use any prepared cranberry sauce — bonus points if it has some orange flavors in it. 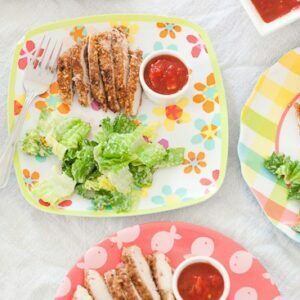 These would be a good snack to take with you while you’re shopping all weekend. Are you a Black Friday fanatic? I wasn’t until recently — if you stay away from big discount stores, department stores, and electronic stores it isn’t so bad. I mostly hit up the fabric store. It might seem like a nightmare waiting in line at the cut counter, but it’s not bad — at least at ours. They’ve got the young ones working on Black Friday so it’s actually faster than it is on a regular day with the 120-year-old women doing the cutting. Either way, having something to munch on would be nice. I prepped the dough in my food processor! 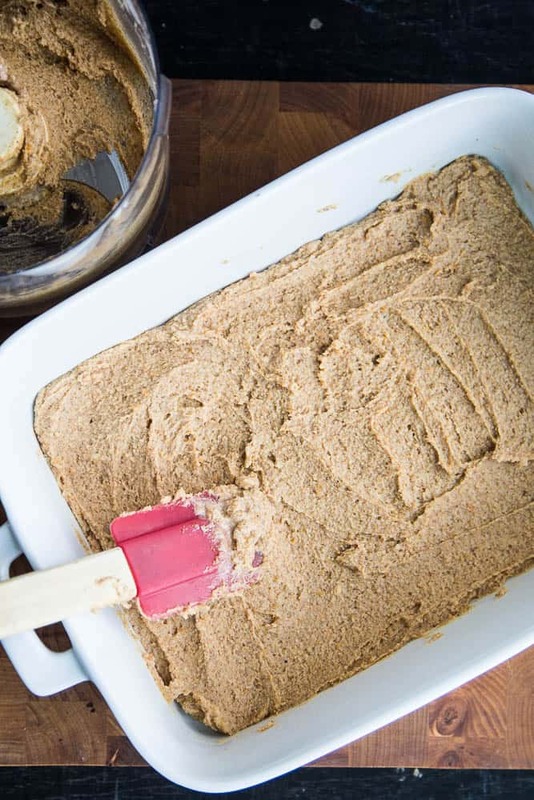 You can use a bowl and a hand mixer if you like, too. Either way it’s a one-bowl deal. 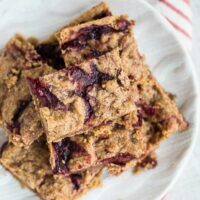 One of the benefits of alternative baking is that overmixing isn’t as much of an issue because you aren’t using wheat flour. I use my processor a lot for stuff like this. 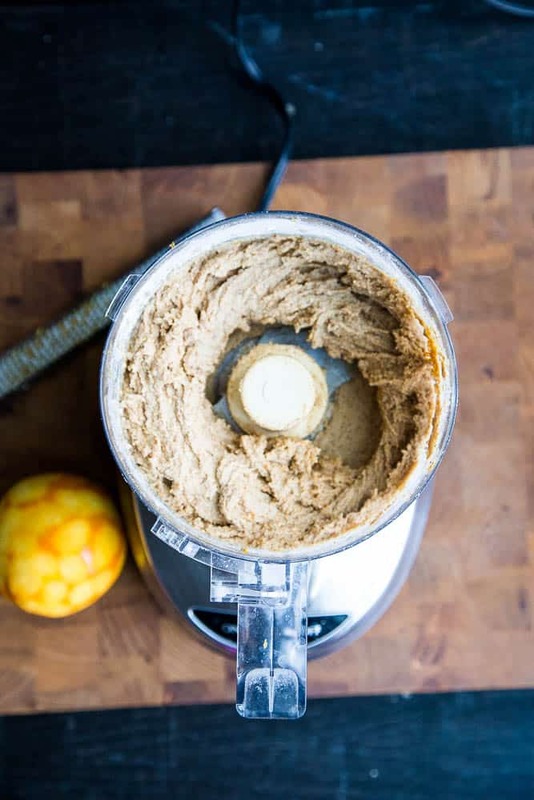 This dough is actually a tweaked version of the Big Chocolate Chip Cookie dough from my paleo slow cooker cookbook with some orange zest. When you spread the dough in the pan it’ll seem like there isn’t much there, but it’ll puff up when it bakes. Mmm. I never knew how much I could like cranberry sauce. My Wassailed Cranberry Sauce has a mix of spices mimicking . . . wassail. (My recipe naming abilities are pretty fantastic, right?) It goes so well with the orange in the crust! 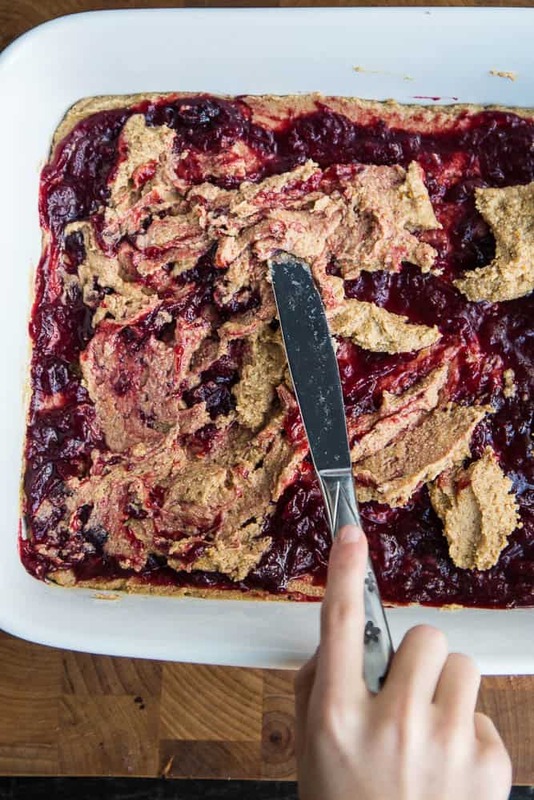 Then you mix the reserved dough with the cranberry sauce to make it all swirly like. Talk about smelling good. 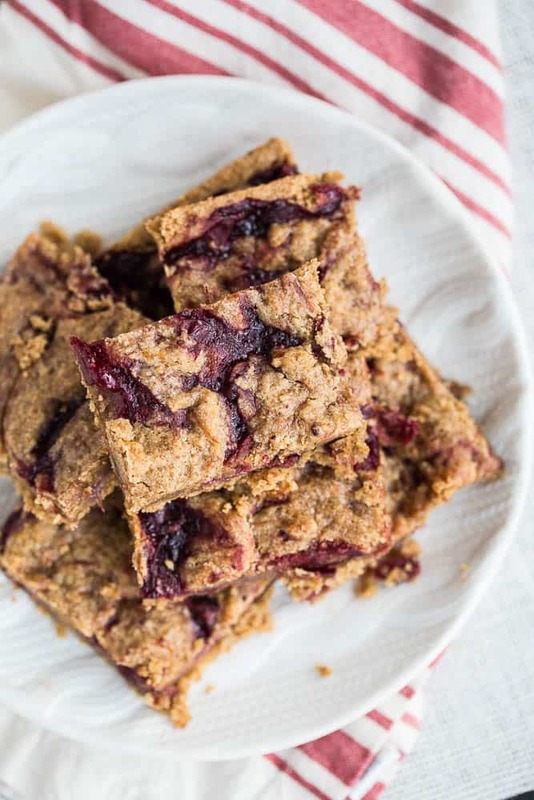 These cranberry bars are WAY better than a scented candle. Honestly, I loved them better chilled. They’re also easier to cut and handle with they’re cold. Also somewhat crumbly, but even at room temperature you can get them out of the pan pretty easily. 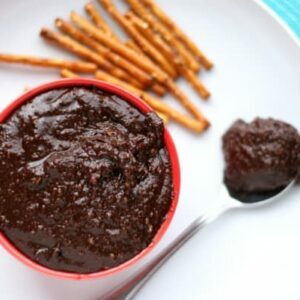 Since they’re paleo friendly you could take them to someone who eats gluten-free or is mostly paleo for a holiday treat! Also, check out this round up of Gluten Free Christmas Cookies over at What the Fork for more gluten-free (and probably easily adaptable) Christmas cookie recipes. 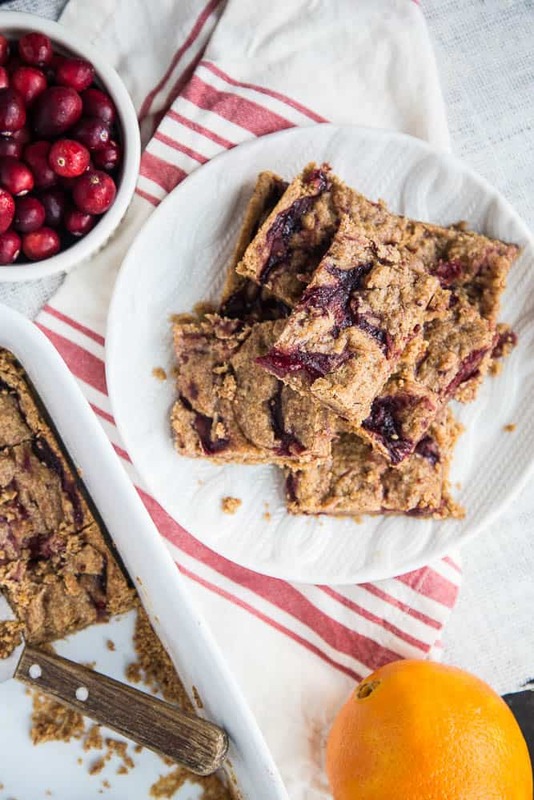 I REALLY hope you saved some leftover cranberry sauce for these orange cranberry bars. They're especially good with my Wassailed Cranberry Sauce! 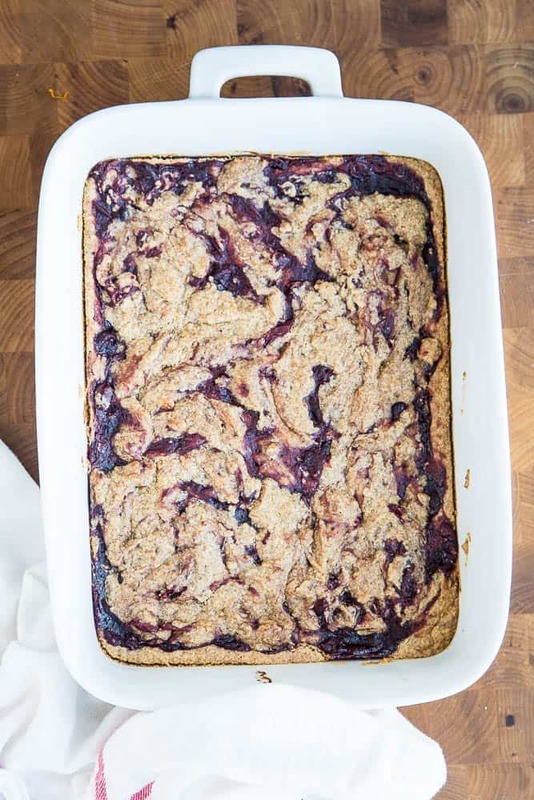 Preheat the oven to 350 degrees F. Prepare a 9x13" baking dish with nonstick cooking spray. 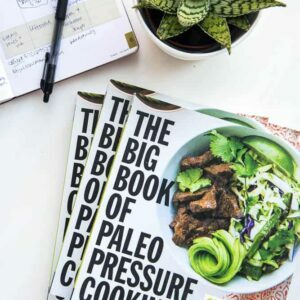 In a food processor prep bowl (or large mixing bowl with a hand mixer) combine the palm oil shortening, almond butter, coconut sugar, and coconut oil. Process until smooth. Add the egg, vanilla extract, stevia, and orange zest. Pulse until smooth. Add the almond flour, tapioca flour, salt, and baking soda. Blend until smooth. Transfer 3/4 of the dough to the prepared baking dish and spread evenly. Add the cranberry sauce on top and spread that evenly, too. 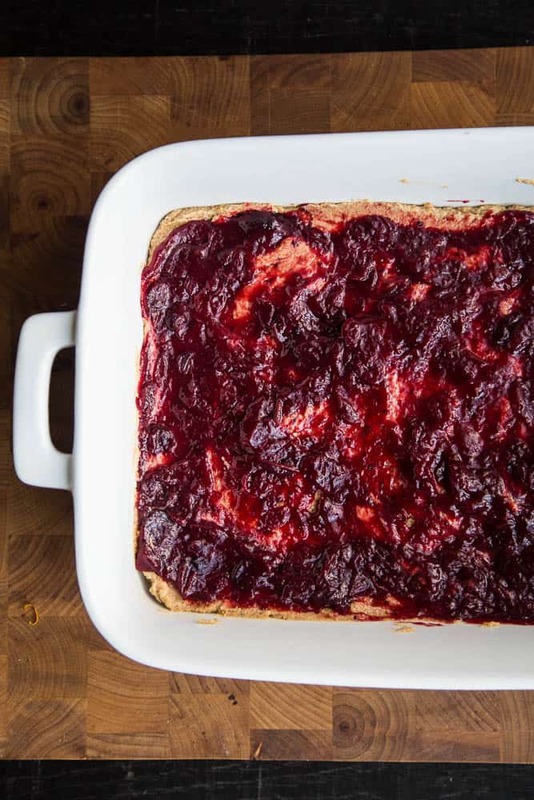 Add the remaining dough by spoonfuls on the cranberry sauce, and use a knife to swirl the dough around with the cranberry sauce a bit. Make sure that there isn't too much dough piled up around the center -- push it toward the edges of the pan if necessary. Bake for 20-25 minutes until the edges are golden brown and a toothpick inserted into the center comes out clean.